The Cuban transition from a totalitarian state to a more politically open form of government with a market-oriented economy will entail a vast transformation of the country’s institutions. While daunting, this process offers many opportunities. Cuba can learn from the experiences—positive and negative— of other nations that have gone through similar processes and adopt institutional structures suited to curbing corruption and creating an environment where the private sector can flourish while developing a lean and efficient government capable of delivering quality services. This paper offers an inventory and description of policy initiatives found or believed to be effective in other national settings in combating corruption and promoting transparency/accountability that may be relevant to a Cuba in transition. These initiatives may provide guidance to a transition government in the island. They may also provide guidance to the international development community, likely to be a key player in Cuba’s transition and economic recovery. • Administrative corruption arises from the use of public office for private gain. This form of corruption was endemic in socialist countries with state ownership of the means of production and centrally planned economies. Examples of administrative corruption include bribes, “grease payments,” and misdirection of public property by state officials to their own benefit or that of their families. • State capture refers to the activities of individuals or groups to influence the formation of laws, decrees, regulations and other government policies (i.e., the basic rules of the game) to their own advantage by means of the illicit and non-transparent provision of private benefits to public officials. This form of corruption arises primarily early in transitions when legal frameworks are not yet in place. For example, an oligarch at the head of a powerful financial or industrial group could buy off legislators to erect barriers to entry in a particular sector. A transparency/accountability strategy must address both administrative corruption as well as state capture and be comprehensive enough to encompass short-, medium- and long-term interventions, so as to minimize corruption during and after the transition. The design of anti-corruption transition strategies has a strong temporal dimension. For purposes of this paper, we define the short term to coincide with the onset of the transition, the time period (1 to 2 years) when first generation reforms are implemented. 2 On the transparency/accountability front, the focus during this stage of reform should be on minimizing the illegal acquisition of national assets by corrupt public officials and others in position of authority or with insider knowledge. At the same time, the basic foundations must begin to be set for a transparent and honestly-managed public sector, and for the minimization of opportunities for corruption at the interstices where the private and public sectors meet. The mid- and long-term coincide roughly with the time period when second generation reforms are implemented. The transparency/accountability strategy during this period should focus on creating a modern public sector with transparent, efficient and customer- oriented dependencies, grounded in a legal system respectful of human rights, equipped with appropriate control institutions, and under the oversight of a free and independent media. At the same time, efforts should be made to empower an educated citizenry to assure their overview rights are respected and to demand that the national government complies with international obligations to curb corruption. Cuba will benefit from what has been learned in other transition economies, and from what the international development community has to offer in terms of technical advice and financial support. The international development community can assist Cuba early in the transition process by establishing technical consultative bodies to assist with the development and monitoring of liberalization policies. A privatization board jointly staffed by Cuban nationals and expatriate consultants experienced in the design and management of such programs, for example, could ensure at least a minimum of transparency during the privatization of state-owned assets. While combating corruption has not been at the forefront of the priorities of policy makers during this crucial period of the early transition, properly designed, transparent and well implemented liberalization, privatization and competitive procurement policies can help control corruption and check oligarchs’ attempts to capture the state. Also very important during this period will be vigilance by the international community—an expected key source of reconstruction and emergency assistance—to prevent corrupt officials from appropriating foreign assistance funds. Some macroeconomic reforms and deregulation can contribute to the expansion of markets and reductions in rents. Lowering and eliminating tariffs, quotas and other barriers to international trade as well as eliminating exchange rate restrictions, price controls and unwarranted permit requirements will strip government officials of discretion and of the power to extract bribes. At the same time, removing such controls reduces transaction costs, eliminates supply bottlenecks and fosters competition. If unchecked, domestic interests will attempt to slow down or build in exemptions for their industries wielding infant industry arguments and painting doomsday unemployment scenarios. In addition to salutary economic efficiency effects, privatization removes the state from economic activities and reduces opportunities for corruption in sales, procurement, employment and financing. To ensure the integrity of privatization, transparency measures must be an integral part of such processes. Privatization must also be accompanied by regulatory and commercial frameworks that promote competition and protect consumers and investors. In the absence of such frameworks, privatization merely shifts rent seeking from governments to the private sector. During the early stages of the transition, large-scale privatization of state-owned enterprises is unlikely as much work is necessary to prepare the ground for such action. Before large-scale privatization of stateowned enterprises can occur, it will be essential to put in place a basic institutional framework to make the process transparent and accessible facilitate and maximize returns to the nation. A more likely vehicle to promote competition in the early stages of the transition is the stimulation of small and medium size enterprises (SMEs). Essential for the creation of SMEs is a macroeconomic environment that promotes stabilization and growth. Based on the experience of the reforming countries in Central and Eastern Europe, among the policies that can promote SMEs early in the transition are an economic stabilization program that imposes hard budget constraints and minimizes state subsidies; efficient markets that foster competition through deregulation and liberalization of markets and prices; sound and transparent fiscal policies and fair and effective taxation (Gayoso 1999:62). A fair and efficient taxation system can dissuade companies to go underground (that is, into the informal sector) to evade taxes and raise sufficient revenue to allow the state to provide essential services. Also important is to establish as streamlined a system of licensing of SMEs as possible in order to accelerate their establishment, encourage their legal status (critical in the longer term for the establishment of a taxation system), and reduce the opportunity for administrative corruption (bribes, “grease” payments) that officials who issue permits might demand. Transparency International (TI), a non-governmental organization that leads the global fight against corruption, has proposed a model “National Integrity System” or transparency/accountability strategy for governments to promote “the public interest rather than the private interests of those in control.” The challenge for countries embracing democracy, including countries in transition, is (Pope 2000:33): to move away from a system which is essentially top down: one in which an autocratic ruling elite gives orders which are followed, to a greater or lesser degree, by those down the line. The approach is to move instead to a system of “horizontal accountability”; one in which power is dispersed, where none has a monopoly, and where each is separately accountable. Several interconnected and mutually supporting elements are necessary for an integrity system to come into fruition. It begins with the standard separation of power (executive, legislative, and judicial) that check the power of rulers in democratic systems, complemented by active citizen involvement and institutions specifically charged with preventing corruption. An integral part is an independent and free media and an informed citizenry willing to provide continuous oversight over how public funds are managed and spent. Equally important are a legal infrastructure to prevent and punish corrupt acts, a professional civil service capable of effectively and honestly running government operations, and specialized official entities (e.g., Comptroller General Office, Ombudsman, investigation agencies, Anticorruption commissions) with a partial or full focus on corruption. Although the specific components of an integrity system and how they function may vary from country to country—according to form of government, legal tradition, and so on—the ultimate goal is to have them operate as part of a coherent whole that, through its combined actions, interferes with the ability of dishonest individuals to exploit corruption opportunities. If they do, the system should be capable of detecting and punishing corrupt acts. It is beyond the scope of this paper to dwell in detail on the legal infrastructure that will be necessary for transparent and honest government. The constitutional and legal foundations of a future Cuba are complex problems whose elucidation will be partly determined by the country’s legal traditions, the nature of the transition, and the leadership of the nation. These domestic legal foundations could build upon transnational legal instruments that could support national anti-corruption initiatives (more on this below). Domestic legal anti-corruption measures generally fall into preventive and curative instruments. The former refer to “a set of upstream rules and norms of good behavior (codes of conduct, manifestos, declarations) conducive to a corruption-free society.” The latter consist of “anti-corruption laws proper (general or specific legislative enactment), whose purpose is to provide appropriate remedies, including criminal sanctions and penalties, procedural rules, and institutional mechanisms, as needed, to combat acts of corruption that have already occurred” (Ofosu-Amaah, Soopramanien, and Uprety 1999:3). • Sunshine laws that require government officials to hold certain meetings in public, promoting accountability and transparency in government decision making. Particularly important is public access to meetings discussing budgetary issues and leading to decisions regarding the use of public property as is reliance on public hearings to inform citizens about public policy issues and to obtain citizen input regarding the development of laws, rules and regulations. • Freedom of access to information, a cornerstone of democratic government, is based on two elementary principles: citizens have a right to know how they are governed and the higher the level of opacity, the greatest the opportunity for mischief. For example, citizens should have a right to know the text of draft legislation being considered by the government, views put forth by parties regarding legislation, and the voting record of elected officials. • Public financial disclosure is a set of rules that requires government officials with certain degree of decision-making power to disclose periodically the extent and nature of their assets not only to prevent illicit enrichment while holding power but also to identify potential conflict of interest in decision-making. • Whistleblower legislation that affords employees the right “to challenge workplace corruption and mismanagement” since “secrecy and silence through intimidation and fear are the ultimate objectives and methods underlying organizational reprisal techniques” is a sharp surgical instrument to expose and prosecute public and private corruption (Keshet and Devine 2002). • Ombudsmen offices, when properly organized and managed, and truly independent of the government organizations they monitor, can contribute to good governance by allowing citizens to raise concerns about government issues and for government offices to respond to those concerns (Pope 2000:83-94). The domestic legal framework should also devote special attention to issues related to drug trafficking, money laundering and human trafficking. Following the dismantling of Cuba’s police state and the opening and increasing integration of Cuba to the global economy, these types of illicit activities are likely to increase significantly unless effective preventive and prosecutorial measures are put in place. The international community has adopted several legal instruments to minimize public sector bribery and other illicit practices, recognizing that “international cooperation can help engender both the will to fight corruption and the capability to do so” (Klitgaard 1998:5). Since bribery often involves illegal payments by transnational corporations to public officials in the country where the corrupt act occurs, international instruments tend to complement each other by criminalizing bribe payment by foreign firms and/or penalizing bribe acceptance by public officials or politicians in countries where paid. International cooperation is also often needed to investigate, prosecute and punish corrupt individuals (or to recover ill-gotten assets) even when the offense is committed solely within a country’s borders without involvement of an offender from another country. Of particular relevance for a post-transition Cuba are anti-corruption conventions developed by the Organization for Economic Cooperation and Development (OECD) and by the Organization of American States (OAS). • The Convention on Combating Bribery of Foreign Public Officials in International Business Transactions, adopted by the OECD in 1997 (OECD 1998). It is intended to prevent bribe payments by private entities of signatory countries conducting business abroad. • The Inter-American Convention Against Corruption (ICAC), adopted in 1996 under the auspices of the OAS. The focus of the ICAC is on curbing corruption at home. It requires signatory countries to develop standards of conduct for public officials, strengthen control systems, and promote civil society involvement in the prevention of corruption (OAS 1998). A Cuba in transition should promptly become a signatory to the OECD Convention and the ICAC (both instruments are open to signature by nonmembers of the OECD and the OAS, respectively) and other relevant international agreements. It should also adopt the necessary legal enabling mechanisms to comply with domestic enforcement and international cooperation obligations embodied by these international instruments. An essential component, or pillar, of a long-term transparency/accountability strategy is a well-trained, professional civil service capable of efficiently discharging its obligations to the nation and the public, while safeguarding the national patrimony. Developing such a professional civil service will require many years of effort. The first order of business will be to establish the foundation for the development of a professional and non-political civil service that operates according to transparent and non-ambiguous rules, makes decisions without favoritism, and makes remuneration and advancement decisions based on merit rather than political favoritism or nepotism. Civil servants should be tenured and compensated adequately to reduce the corruption temptation. The latter will be a major challenge during the early years of Cuba’s transition as its weak economy must address numerous financial demands simultaneously. The actions of the professional civil service should be subject to scrutiny by civil society and by the media. The upper echelons of socialist Cuba’s civil service is by definition thoroughly politicized—Communist party apparatchiks and their families and friends control the top government positions. Furthermore, Cuba’s civil service is bloated, notorious for its inefficiency, poorly attuned to modern managerial concepts, enmeshed in a tradition of secrecy and lack of transparency, oblivious to the notion of customer service, and poorly paid. While the transition away from socialism will lead to a substantial reduction in the number of civil servants as more satisfying and better-remunerated employment opportunities open up in the private sector, a painful process of retrenchment lies ahead. Political sensitivities to some extent will determine which public officials will be retained and which will be let go, but as much as possible these decisions should be made according to skill criteria and managerial need. In doing so, Cuba will undoubtedly benefit from the experience of other countries that have embarked on major modernizations of their civil services. These international experiences offer various reform models that Cuba could consider. They also provide a record of how these complex reform programs could be best implemented as well as off-theshelf training curricula that with relative ease could be adapted to local conditions to upgrade skills and instill transparency and values of service to the public among Cuban civil service officials. Effective management of the national economy was not a policy priority of socialist Cuba. Generous Soviet subsidies, which lasted through the end of the 1980s, served to mask the regime’s inefficiency and misuse of resources. During a period in the mid- 1960s, Cuba went so far as to abolish the Ministry of Finance, operate without a national budget, and eliminate accounting and financial control systems, doing away with concepts such as cost of goods sold and interest payments; the study of economics as well as the career of public accountant disappeared from the university during this period (Batista Odio 1986:239-240). In the 1970s, some of these policies gradually began to be reversed as attempts were made—under Soviet prodding—to regain a modicum of economic efficiency. In 1995, President Fidel Castro, noting that an important factor behind the demise of the Soviet Union had been widespread corruption, called for measures to improve accounting and audit procedures, as well as to reduce black market activities (Reuters 2001). In May 2001, the Cuban government announced the creation of a new Ministry for Audit and Control (Creado el Ministerio 2001) and, at about the same time, the government established a code of ethics for public officials and announced improvement in government accounting practices (Reuters 2001; Columbié Santana 2001). To fulfill its functions adequately and prevent corruption, a Supreme Audit Institution (SAI)3—the functional equivalent of Cuba’s current Ministry for Audit and Control—must be guaranteed political and financial independence. This can only be assured if the SAI is accountable not to an overtly centralized and dictatorial executive, but rather to a powerful legislature in a political system with appropriate checks and balances (Pope 2000:75-82). A post-transition Cuba must guard against the temptation of recreating historical control institutions that have been found elsewhere to fail to control corruption and instead have engendered political deals to cover it, such as the traditional Court of Accounts (Tribunal de Cuentas). The underlying principles behind a Court of Accounts are in conflict with those of a modern SAI. While the latter provides an independent audit function, promotes financial control improvements, and disseminates audit findings, it is not responsible for making legal determinations or prosecuting wrongdoing, the province of the former. That a Court of Accounts is empowered to render judgements and prosecute wrongdoing creates grave conflicts (and the opportunity for cover ups) in the political process that underlies the appointment of its members. Furthermore, the fairness of the Court’s decisions are always open to question since its ruling cannot be appealed based on its own audit findings absent independent review. A SAI can blossom when it provides oversight in a country with sound financial management practices. Since the 1980s, many Latin American countries, at the urging of the U.S. Agency for International Development and with financial support from the World Bank and the Inter-American Development Bank, have embarked on long-term and ambitious efforts to develop Integrated Financial Management Systems (IFMS). An IFMS (Wesberry 2001b:97) consists of: an interrelated set of subsystems, which plan, process, and report on resources, quantifying them in financial terms. The basic subsystems normally are accounting, budgeting, cash management, debt management, and their related internal controls. Other subsystems sometimes included in an IFMS are collection and receivable management, acquisitions and supply management, information management, tax and customs administrations, and retirement or social security system administration, together with their own internal controls. One of the most important elements of internal control is an independent and professional internal audit function, which constitutes an integral part of IFMS. The strength of an IFMS in deterring corruption lies in its ability to generate a “common, single, reliable database to and from which all data flows,” since all data users must submit information to a shared accounting system. As Wesberry (2001b:98-99) notes (see also, Pope 2000:221-234), modern IFMS, dependent on powerful high-technology tools and computing equipment, help prevent corruption in many ways. They provide multilevel budgetary control, permit spotlighting weaknesses, allow for internal validation of integrity, and make feasible the control over resources. Further, IFMS promote transparency, require the use of consistent policies, decentralize authority and accountability, reduce the need for accountants, give immediate audit capabilities, are capable of disclosing patterns of corrupt practices, and facilitate computer assisted auditing. Although the advantage of an IFMS for a post-transition Cuba—both for efficiency in government and curbing corruption—is beyond dispute, it will probably take a decade or more and tens of millions of dollars to make such a system fully functional. An IFMS national in scope requires the development and implementation of accounting and auditing standards, the initial and ongoing training of financial management personnel, and the acquisition and installation of modern computer systems linking all branches of government, from the central government to the municipalities. Fortunately, technological advances, particularly the development of microcomputers and the steady decline in the cost of computing power as technology advances, makes feasible the gradual introduction of modern financial management practices, perhaps focusing first on key organizations (i.e., ministries). Also to Cuba’s advantage is the considerable experience and knowledge the international financial institutions have accumulated through the technical support and financial assistance they have offered to many countries in the design and introduction of IFMS. The literature on public sector ethics suggests that for codes of conduct to be effective, they must be implemented in national settings characterized by political openness and transparency—two ingredients lacking in Cuba today. In order to work properly, codes of ethics must be set in a national environment where the actions of the highest authorities can be discussed and challenged openly. Codes of ethics appear to work best when “an improper act of a professional nature can be questioned by peers, and the professional group may take actions according to the mores of the group” (Ofusu-Amaah, Soopramanien, and Uprety 1999:16). In 1997, Cuba enacted a Código de Etica de los Cuadros del Estado Cubano (Columbié Santana 2001:7). Reflecting the ideological dogma of the totalitarian state, this code of ethics relies on the same principles that over more than four decades have failed to limit corruption in socialist Cuba, and does not address lack of transparency, individual accountability, and the inability to challenge the upper reaches of the political leadership. Once a transition occurs, codes of ethics may have an important role to play in limiting corruption, particularly if institutional mechanisms and enforceable laws serve to control abuses of power. Among other things, public servants should be protected from political pressures, decision-making processes made transparent and open to scrutiny, and adequate accounting mechanisms adopted (Pope 2000:175- 194). Few areas of government activity offer more opportunities for corruption than public sector or government procurement. In pre-Castro’s Cuba, allegations of public sector procurement corruption were common and often the source of political disputes. Since 1959, comparable accusations have become relatively infrequent, mostly due to the centralized nature of the totalitarian state, absence of domestic private firms, and rigid media censorship. In addition, international public sector procurement in socialist Cuba is conducted behind closed doors, outside public scrutiny, and according to whatever rules are found expedient to satisfy political or national security goals, or simply the interests of the ruling elite. With a transition to a market-oriented economy, Cuba would do well to adhere to accepted international norms regarding public procurement. There is a growing global movement to reform public procurement procedures to accelerate economic growth, make government more efficient, and rein in public spending. The impetus for change has been the realization that corruption in public sector procurement creates many economic distortions that interfere with the development process. Key remedies appear to be in the areas of greater transparency and clear rules whereby government contracts are awarded to bidders. Several basic principles define a fair and efficient procurement process (Pope 2002:206-207). It should be economical, that is, through the procurement process, the government should acquire those goods and services that offer the best combination of quality and price. It should also be fair and impartial; bid winners should be chosen on the bases of qualifications and merit. Transparency is of the essence. Bidders should respond to specifications that are announced publicly. The process should have a complexity commensurate with the nature of the goods or services being purchased and, most importantly, should be accountable to the public. The bases for all decisions should be justified and recorded. Public sector procurement should be made as transparent as possible so that “institutions, processes, and decisions are made accessible to the general public or to representatives of the public so that processes and decisions can be monitored, reviewed, commented upon, and influenced by the stakeholders” (Wiehen 2001:86). When appropriate, past procurement experience should serve as a selection criterion provided sufficient information is available to allow as many bidders as possible to participate in public competitions. Related to the above is the need to prevent firms to use information to collude to rig prices. Rose-Ackerman also recommends the use of price benchmarking (for comparable goods and services available in the marketplace) whenever possible to simplify purchases and acquire the best products and services at the lowest price. A basic principle for the design of an integrity- focused procurement system is that the more accountable and transparent it is, the more discretion it could allow public officials to have (Rose-Ackerman 1999:64). In summary, a post-transition Cuba should design and implement public sector procurement procedures guided by the principles of transparency and accountability by public officials. Bidding competitions should, following Wesberry (2001a:86) “describe clearly and fairly what is to be purchased; publicize the opportunity to make offers to supply; establish fair criteria for selection decision-making; receive offers (bids) from responsible suppliers; compare them and determine which is best, according to the predetermined rules for selection.” Contracts should be awarded to selected bidders with no price reduction demands or changes in winning offers. The establishment of modern and transparent procurement procedures should be part of a broader civil service reform process whose ultimate intent is an efficient and responsive state. There is broad consensus in the transparency/anticorruption community that without a vibrant and vigilant civil society, legal and technical measures by themselves are insufficient to stem corruption. Involving civil society in the fight against corruption is at the center of most anti-corruption efforts today. This is the case, for example, with the independent anti-corruption commissions—with a three-pronged mandate: prevention, investigation, and public education (see below)—established in several countries. The rationale behind this mandate is that the three domains are mutually supportive: a well-educated and vigilant public provides crucial input for preventive and investigative functions, while effective prevention and investigation encourage citizen involvement. Other more focused approaches, popular in Latin America, rest on the notion that the citizenry has to be educated and mobilized to provide oversight on how the government sector allocates and utilizes public resources. Social auditing—also known as social control in Honduras, veedurías in Colombia, and score card in India—entails mobilizing citizens to provide oversight over particular types of projects, generally at the community level. While citizen oversight initiatives are part and parcel of the right of association citizens enjoy in a democratic society, and should rightfully have a role to play in limiting corruption in a post-transition Cuba, the history of the country suggests that they should be designed cautiously. More than four decades of government-inspired and -controlled mass organizations4 will surely leave a sour taste among many Cubans. They are likely to see citizen oversight institutions as akin to the totalitarian-inspired mass organizations created by the Castro government as instruments for social and political control. Interestingly, in the former Soviet Union, whistleblower programs advocated in the West have been found to be politically contentious, given the country’s totalitarian past. To succeed in a post-Castro Cuba, future social auditing programs must be provided with very clear and specific legal mandates and promoted strictly on a voluntary basis. A long-term transparency/anti-corruption strategy must consider the devolution of political and financial management to communities, with the proviso that policies must be instituted to help develop the institutional local capability to manage and monitor public spending. Initiatives of this nature must be accompanied by legal instruments designed to encourage community participation in decision-making and granting unrestricted oversight rights to individuals and citizen groups over how local government decisions are made and financial resources managed. It should be obvious that aside from its beneficial effects in controlling corruption, decentralization of financial and management authority will result in the deepening of democratic governance by encouraging citizen involvement in all facets of political life. Citizen oversight is most effective in combating corruption when broad sectors of society join forces to do so. While the efforts provided or led by individual citizens often are crucial, collective actions instigated or embraced by citizen group organizations coalescing around particular goals or professional interests can have multiplier effects that greatly enhance the impact of anti-corruption initiatives. Most obvious are those social benefits that could accrue from actions individually taken by professional associations —accountants, auditors, lawyers, engineers, physicians, educators—labor unions, media, business associations, and others to curb corruption. These could include, for example, the adoption of professional or business codes of ethics, ethics training, or peer oversight monitoring mechanisms to ensure proper conduct. The business sector has a key role to play in the implementation of transparency/anti-corruption initiatives. Private sector firms often bear the negative impact of public sector corruption, while others, perversely, benefit from it. Most reputable businesses would prefer to operate in a competitive, corruptionfree environment, but often they are deterred from doing so by a “prisoner’s dilemma”: firms unwilling to pay bribes or provide other favors to corrupt officials often lose business to firms not likewise constrained. But if the private sector becomes organized and works together with civil society, this situation can be changed. Business associations that adhere to ethical principles can have a major impact on corruption by assisting their members in rejecting bribery and other shady deals. Such associations could enact and help enforce business ethics codes, assist individual firms comply with procurement procedures and rules to prevent the payment of bribes, and serve as a conduit for an ongoing transparency-promotion dialogue between the private and public sectors (OECD 1999). Even more significant is the coming together of different social sectors to achieve common goals, as when professional associations lend their technical expertise to civil society organizations to monitor the manner in which public sector projects are designed and managed, or funds spent. The cooperation principle is implicit in many social auditing schemes, for example when professional associations provide expertise to citizen watchdog groups, or when firms agree to public procurement bidding principles monitored by citizens’ organizations. If a true commitment exists to adopt ethical and transparent values, the broader the coalition to gradually expand an integrity framework, the better. In Cuba’s case, such lofty cooperation will not be achieved overnight. Many developments will have to come together to erode the country’s ingrained corruption tradition and begin to create a culture of honesty and transparency. How will independent professional and partisan interest groups be organized and operate? Will economic growth be sufficient to allow individuals to satisfy their families’ needs without having to steal from each other or the state? Will Cubans gradually adopt commonlyshared civic and probity values, consistent with good governance and market principles? Will they overcome the behavioral legacy left by an economy of scarcity? When will they come to realize that the right to associate freely, without coercion or political manipulation, is a fundamental precondition to control corruption and to ensure Cuba’s democratic governance? These are major questions indeed. They call attention once again to the priority a post-transition Cuba must assign to promoting equitable economic growth, establish transparent government institutions, and promote education in civic values. Discounting the ignorance about democratic governance issues to which the population of Cuba has been subjected throughout more than four decades of socialist rule could be very costly. Modern concepts of transparency and accountability are unknown to most Cubans, who have lived under socialism for more than forty years. They have been taught that the paternalistic state is not to be questioned, and are only familiar with the information provided by the state media. To most Cubans, the concept that public servants are accountable to the citizenry is foreign, as is the very notion of transparency—the right of citizens to know how government decisions are made. These basic principles are second nature to citizens of democratic societies, but will come as a revelation to many Cubans. This is not surprising, as unfortunately even today in many countries in Latin America and other developing regions, basic rights of access to information and public accountability do not fully exist. As in Cuba, in some countries the state budget and how it is derived are treated as state secrets, programmatic and spending decisions are still made in the dark, and public officials act as if they were accountable to no one. These are most fertile grounds for corruption to flourish. Once the transition begins, a systematic and longterm effort must be made to educate the citizens of Cuba regarding their right to know and to monitor how government operates. These efforts must begin at a very elementary level and include concepts such as transparency and accountability as part of a broader national effort to inculcate in the population basic knowledge about basic democratic governance principles and how a market economy operates. Governance education must also pay attention to the awe in which most Cubans regard the State: they must be taught that actions by public officials could and should be challenged when warranted without fear of retribution. These are obviously long-term education efforts that should be conducted through every possible means: the mass media, school curricula, civic organizations and by government itself. An important policy decision for a post-transition Cuban government will be whether to establish an anti-corruption commission as a vehicle for the private and public sectors, as well as civil society, to collaborate in the development, implementation, and monitoring of a national transparency/accountability strategy. Such commissions have been established in several countries under different formats to provide a forum for representatives of government, business and civil society to meet regularly to identify, discuss, and make recommendations regarding transparency/ anti-corruption issues. Some national commissions serve as consultative or policy making bodies exclusively, while others have a more formal and broader mandate that might include an investigative role (e.g., the well-known Hong Kong Independent Commission Against Corruption or the more recent Independent Corrupt Practices and Other Related Offenses Commission, ICPC, in Nigeria). In functioning democracies with transparent and efficient public sectors and routine citizen oversight of government activities, such commissions are unnecessary and redundant. The opposite appears to be the case in countries with a history of authoritarian rule and lacking a transparency tradition. In a transition Cuba, a consultative and policy anticorruption commission, composed of business and civil society members with an integrity reputation to protect and honest and politically-influential government officials committed to a transparency agenda, could serve to maintain the corruption issue in the limelight and to effectively mobilize public opinion. Equipped with a small but well-qualified staff, and with assured funding from general government revenues (or from international sources, if needed), an anti-corruption commission could serve as a channel for ongoing government-business-civil society dialogue and as a transmission belt for citizen input. While functionally limited to act as a consultation and recommendation body, the commission could be legally empowered to review government policies and programs and required to make its recommendations public. In establishing a transparency/accountability commission, several decisions would be critical: the number and composition of its membership, criteria for selection of the membership and persons responsible for the selection, term of service of members, process for filling vacancies, and rules of procedure of the commission. If vested with the proper authority and a trusted membership, a transparency/accountability commission could serve as a highly visible forum in a Cuba in transition for dialogue, citizen education, and development of policy-oriented recommendations. It could further serve as a confidence building body for a citizenry not familiar with the proper management of the state and its interaction with the public and private sector business interests. Corruption occurs in the dark and takes advantage of emerging opportunities. Corruption abhors transparency, sunshine and accountability. To control corruption, particularly during transitions when large changes are occurring and policies are in flux, it is essential to be constantly on the lookout for creative new approaches to beat the system, and be prepared to fine-tune control mechanisms. The international financial institutions and the bilateral development agencies can play an important role in preventing corruption in a post-transition Cuba. First, they can implement transparency/accountability policies to prevent corruption within their programs. Second, they can assist in financing government- and civil society-sponsored anti-corruption initiatives, including projects to strengthen the rule of law, financial control and accountability mechanisms, and citizen oversight. Third, a post-transition Cuba should benefit from the technical transparency/ accountability support and financing likely to be provided by the international donor community. Finally, the international development community should prod a future Cuban government to adopt a proactive transparency/accountability strategy. While it may never be possible to totally eradicate corruption in Cuba—or anywhere else for that matter—the toolbox available today to combat it is growing exponentially. Transparency, accountability, vigilance and preparing for the worse may well be the best deterrents to prevent the scourge of corruption from derailing the long-awaited transition in the island. 1. 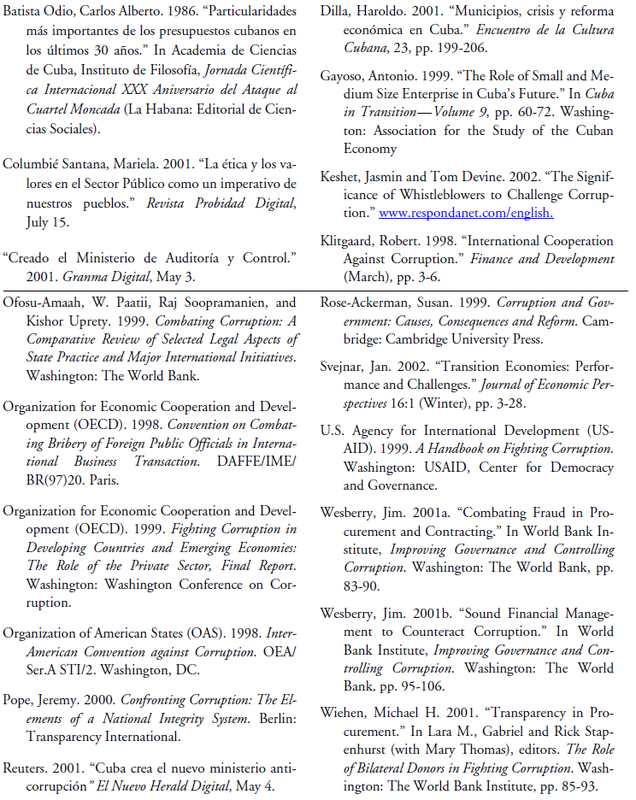 This paper is based on the authors’ longer paper, “Alternative Recommendations on Dealing with Corruption in a Post-Castro Cuba,” prepared for the Cuba Transition Project, University of Miami, September 2002. The paper expresses only the personal views of the authors. 2. First generation or Type I reforms typically include macroeconomic stabilization, price liberalization, encouragement of new firms, and the dismantling of the institutions of the socialist system (including the break up of state-owned enterprises and selected privatization actions). Second generation or Type II reforms typically involve the development and enforcement of laws, regulations and institutions that would ensure the successful market-oriented economy, among them completing the privatization of large and medium size enterprises; establishment and enforcement of a market-oriented legal system and accompanying institutions; further in-depth development of a viable commercial banking sector and the appropriate regulatory infrastructure; labor market regulations; and institutions related to public unemployment and retirement systems. The illustrative list of measures is drawn from Svejnar (2002:5). 3. In many countries this function is performed by the Office of the Comptroller General. 4. The reference here is to the official mass organizations, such as the Committees for the Defense of the Revolution (CDR), the Federation of Cuban Women (FMC), the Cuban Workers’ Central (CTC) and the Union of Communist Youth (UJC). These mass organizations, among others, are explicitly mentioned in Article 7 of the Socialist Constitution of 1976. 5. This has been the case even in highly centralized Cuba, where in recent years municipalities have been granted a greater say over the management of social services (Dilla 2001).